Windows XP has been officially released. Like you, I have read various reports about it. As usual Microsoft is saying XP is the best Operating System ever. I for one will be in no hurry to upgrade. I have heard all of that hype before. Windows ME was supposed to be a "must have" upgrade with innovations like the Movie Maker and System Restore. Well I have now been using Windows ME on my new 1 GHz computer for over 6 months and while it has some nice added touches, it is not that much of a leap from Windows 98SE which I have on my old computer. Since Windows ME came preinstalled on the new computer I accepted it. But if I had been making the choice to upgrade from Windows 98SE I would have passed. If you read some of the postings on the Microsoft Newsgroups for Windows ME you would be afraid to ever upgrade. There are so many horror stories. I find it hard to believe people have so many problems as I have had no major problems with Windows ME. System Restore was one of the much touted reasons for upgrading to Windows ME. Although I have this feature enabled, I have yet to invoke it's use to return to an earlier point in time. I have read reports where people have actually disabled this feature and there is apparently a program that will even remove System Restore and revert Windows Media Player 7 back to version 6. The reason for these drastic measures appear to be System Restore using up too much computing power running in the background and Windows Media Player 7 being a memory hog. I guess some people feel they need every last shred of computing power. I agree that Windows Media Player 7 is much over blown. Features like skins and visualizations are unnecessary fluff I can do without. They are nice at the start but the novelty soon wears off. One thing I really hate about Windows Media Player 7 is the way it tracks everything you play on it. It seems to think every file I load into it I want to return to and automatically adds it to my Media Library. There are many files I play from the Internet just to see what they are about but I have no desire to save them or ever return to them. So why is Media Player 7 automatically keeping a record of where these files are and how many times I have played them? Why do I care that on 06/08/2001 at 12:36:35 AM I played an MP3 file on the Internet called "Napoleon_s_exile" and the request was made from a M3U file which was auto downloaded into my Windows Temp directory? That file was emptied from my Temp directory many moons ago so why is Media Player saving the information? This sure seems like overkill to me, not to mention that I have to later go and delete all of these meaningless entries. Even when I delete the files they only go into a "Deleted Items" folder. It's similar to the Windows Recycle Bin. I have to go into that "Deleted Items" folder and delete the entries again. If there is some option for turning off this Media Library auto tracking I have not found it yet. Another feature of Media Player 7 that bothered me is on the "Player" tab under "Tools/Options." On this tab under "Internet Settings" is a check box that was apparently checked by default that says "Allow Internet sites to uniquely identify your player." That sure sounds like an invasion of my privacy. It took me a while to discover that one. I promptly unchecked that box. Personally instead of waiting for Media Player 7 with all its overhead to load up I use IrfanView (http://www.irfanview.com/) for immediate playing of many multimedia (video/audio) files as well as graphic files. I reviewed an earlier version of IrfanView in my June 2000 Web Master Wanderings (http://www.scpcug.com/wmwand17.html). This excellent freeware program continues to add more and more useful features. You can read some reviews of IrfanView at Epinions (http://www.epinions.com/cmsw-Graphics-All-Irfan_IrfanView). IrfanView supports over 50 file formats. I have yet to find any negative comments about this "must have" program. I find having a shortcut to IrfanView on my Windows ME Desktop comes in very handy as I can immediately drag and drop files into it for playing or viewing. IrfanView also has a feature for capturing screen images under "Options/Capture" in its dropdown menus. This feature allows you to capture the whole screen, the foreground window or just the client area of the foreground window. There are options for capturing via a hot key or automatically via a timer delay. You can also include the mouse cursor in the capture if you desire and save the capture in a variety of formats and to a drive location of your choosing. I have used this capability many times to save screen captures for my Web Master Wanderings articles. As easy as the IrfanView screen capture feature is, I have found what I consider a more intuitive way of capturing screen images. This works especially well if it is a "spur of the moment" thing like an error dialog box popping up and I want to save what it says for analysis later. Depending on how large a screen area I need to capture I either hit the "Print Screen" key (located in the upper right area of the keyboard) which saves the entire visible monitor screen or I press the "Alt" key at the same time as the "Print Screen" key which saves just the foreground window (highlighted window). My capture is now on the Windows Clipboard. I doubleclick the IrfanView shortcut on my Desktop to open it and from the dropdown menus select "Edit/Paste." My capture is now visible in IrfanView. Holding down the left mouse button, I can now draw a box around exactly the part of the capture I want to save. From the dropdown menus I select "Edit/Crop" to crop the capture to the boxed area. Finally, from the dropdown menus I select "File/Save As." In the resulting dialog box I can choose the file format I wish to save the capture in and its location. For saving graphic images like dialog boxes, where their are blocks of color and to minimize file size, the best format is GIF (Graphics Interface File). If the capture is a photo, where their is gradual blending of colors, the format of choice is JPEG (Joint Photo Experts Group). For a capture intended to be printed, like captures for the hardcopy published version of the Space Coast PC Journal, the format of choice is TIF (Tagged Image File). The nice thing about selecting "Save As" is you can save the same capture in more than one format as the original capture remains available in IrfanView. You just repeat the "Save As" step and select a different format from the dropdown arrow in the resulting dialog box next to where it says "Save as type." This is what I do for Web Master Wanderings articles. I save the capture for the web version of my article as a GIF (or JPEG if a photo) and I save the capture for the hardcopy published version as a TIF with LZW compression (a compression option in IrfanView). Another freeware program I find useful is SlowView (http://www.slowview.f2s.com/). It is basically an Image File Viewer but like IrfanView also plays multimedia (video/audio) files. SlowView does not have as many features as IrfanView but like all graphics programs does certain things in a slightly different way which may or may not appeal to you depending on your own preferred computing style. Don't let the name fool you. SlowView is very fast at loading files and like IrfanView I keep a shortcut to it on my Desktop. SlowView has been compared as the freeware equivalent to earlier versions of the very popular shareware program ACDSee (http://www.acdsystems.com/English/index.htm). I think SlowView is definitely worth a look. Earlier I mentioned Windows ME Movie Maker. Movie Maker is one feature of ME that had sparked my interest when I first heard about it. But now that I have actually tried it, I can say that I am not at all impressed. This is about as basic as one can get for editing movies. There is no capability for creating titles. You have to do that on your own in another graphics program. I use Paint Shop Pro (http://www.jasc.com/products/psp/) to create titles on a background and then save them as a JPEG which can then be imported into Movie Maker. The only scene transitions you can do with Movie Maker are either a jump cut or a dissolve. By importing a black JPEG it is possible to fade-in or fade-out a scene but that is about it for any effects. Another severe limitation is your movie can only be saved to Microsoft's WVM file format. I guess the thinking behind that was everyone gets Windows Media Player with their version of Windows so everyone can play the files (not to mention some Microsoft self promotion). Having a video camera is not a requirement for experimenting with Windows ME Movie Maker as you can import movie clip files to play with from other sources such as CD-ROMs or the Internet. In fact, if you really want to get simple, you can just import JPEG photos and create a slide show with dissolves from one image to another and add a sound track. However, it is always more fun when you have your own personal videos to edit. My new 1 GHz computer came with two USB (Universal Serial Bus) ports as most new computers do. I had been anxious to see if these ports actually worked so when Circuit City advertised a $30 USB video webcam for only $5 after rebates, I jumped on it. The camera is a D-Link model DSB-C100 (http://www.dlink.com/products/usb/dsbc100/). The picture quality is not as good as that delivered by the combination of my Sony Hi-8 Camcorder and AverMedia Video Capture card but it is adequate for video conferencing, videomail messages, and quick video stills. It is very convenient as the camera is always "on" while the computer is running. There is no "on/off" button. Also the camera is small enough to sit on my 17-inch monitor. After easily installing the webcam drivers and playing with the included videomail software I tried the webcam in Windows ME Movie Maker and, as expected, it worked fine. But then I discovered something unexpected! I had opened IrfanView and by happenstance was looking through the menus. 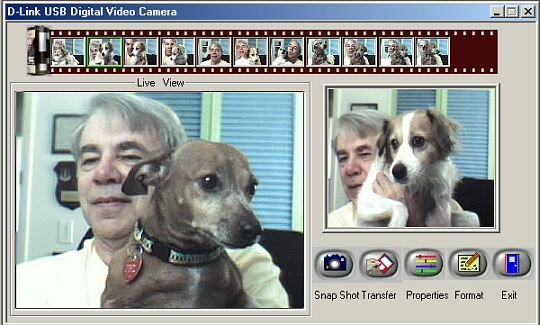 When I went to "File/Select TWAIN Source" a dialog box popped up showing "D-Link USB Digital Video Camera 1.0." I clicked on the "Select" button and then went to "File/Acquire." To my amazement up pops a screen with my live video picture on it along with buttons for "Snapshot," "Transfer," "Properties," "Format," and "Exit." Along the top is a film type viewstrip with 11 thumbnail size locations for temporarily storing snapshots. One can select to view any of these stored snapshots on a second view screen at the right. Clicking the "Transfer" button automatically places the selected image in IrfanView for any additional processing and/or saving. At first I thought this was a feature of IrfanView but then discovered the same screen came up in Paint Shop Pro and Microsoft Home Publishing 2000. I would guess any graphics program that allows selecting a TWAIN source should have this capability. Apparently it is a feature of Windows ME and a very useful one I might add. It provides for a fast and simple way for grabbing a video still image, something that comes in handy when making greeting cards as you can insert an instant photo in the card. The one fault I found with this feature in IrfanView and Microsoft Home Publishing 2000 is once you select a snapshot to transfer, the rest of the images stored in the thumbnail viewstrip disappear. Thus, there is no way to select a second image for transfer. So if you have two or three good images you are forced to pick only one. Fortunately with Paint Shop Pro the viewstrip screen does not disappear when the first image is transferred. Therefore you can transfer all captured images for processing within Paint Shop Pro. As I said at the start, Windows ME has some nice touches (like the ability to grab instant video stills) but nothing that would have caused me to pay the upgrade price if my current computer was running Windows 98SE. From what I have heard so far, the big advantage of Windows XP appears to be stability. Think I'll continue to live with Windows ME's instability for now. Maybe I am lucky, but for me it has not been much of a problem. Besides, if one does a XP compatibility check, one finds that Windows XP requires buying new upgrade versions for many utility type programs like antivirus, firewalls, drive partitioning, etc. I'm sure all of the software makers will be happy to sell you their new XP version. Therefore, the true cost of upgrading to Windows XP will most likely be greater than just the Microsoft XP Software price.